Whether you’ve had a mishap at work, forgotten to remove a pen from your pocket, or your kid has decided to draw a beautiful picture on your shirt, ink stains are never a pleasant sight. Not to mention it can be a bit of a challenge to remove ink stains from clothing, especially depending on the kind of ink you’re dealing with. 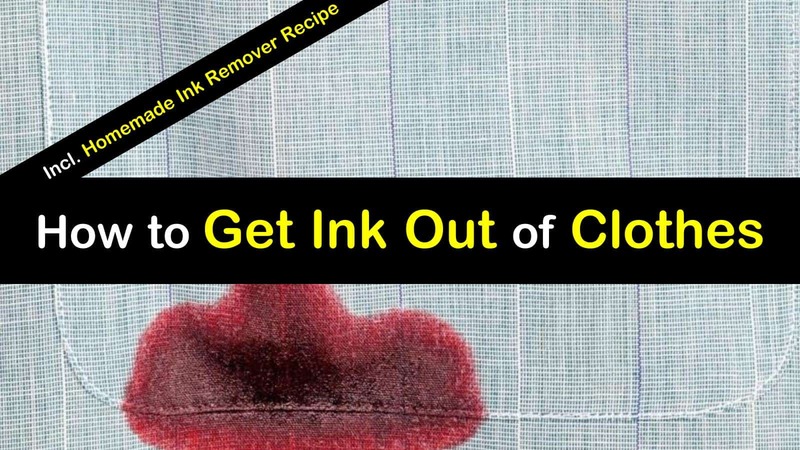 Learn how to get ink out of clothes with these simple techniques and homemade stain remover recipes. Not all ink stains are created equal. If the ink stain is water-based, you’re lucky. Water-based ink stains, like those from a washable marker, are the easiest when it comes to removing ink stains from fabric. However, a stain from a permanent marker or highlighter is much more difficult to remove. Ink from a ballpoint pen falls somewhere in the middle, while it can be tricky to deal with, most treatment methods will be useful in removing ink from clothing. There are also specific remedies for getting ink out of leather, whether it’s a purse, shoes, furniture, clothing, or boots. Each kind of ink stain will react differently to the various cleaning methods described below. Each technique uses everyday products that you already have in your home. There are plenty of different options when it comes to the ink stain removal techniques you can try. The first step in ink stain removal is to figure out the type of ink and match the solution that will work best. 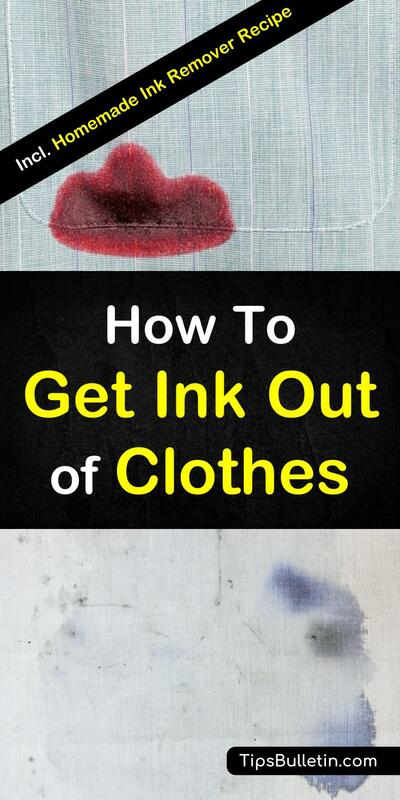 Here’s how to remove ink from clothes. This traditional method is ideal for removing water-based ink stains. Place the stained garment on top of a clean, dry cloth or towel. Apply warm water to the stain, and using another clean cloth, blot the stained area. The stain should begin to transfer to the fabric. Next, apply a small amount of liquid laundry detergent to the stain and allow it to stand for five minutes. Throw the garment in the washing machine and launder, using the hottest water recommended for the type of fabric. Check to make sure the stain is no longer visible, before placing the clothing in the dryer. If you can still see the ink stain, repeat the steps until you eliminate the stain. Rubbing alcohol is an effective way for how to get a pen out of clothes, especially those pesky stains from permanent markers or ballpoint pens. It is frequently used to remove ink from suede and other microfiber materials. Before you use this method, test the rubbing alcohol on an inconspicuous area of the garment to ensure that it won’t further damage the material. Place the stained item on top of a clean white towel. Soak a cotton ball with rubbing alcohol and blot the area. To prevent the fabric from reabsorbing the ink, be sure to move the towel underneath when it becomes wet and discolored. Continue the process until you eradicate the ink stain. If you are trying to remove a stain that is from a ballpoint pen after you’ve blotted it with rubbing alcohol, apply a few drops of laundry detergent to the area and let stand for three to five minutes. The wash it in the hottest water that is safe for the garment. This two-step process vinegar/cornstarch technique is often used to get oil out clothes and to remove ink stains from clothing. Start by wetting the stain with the vinegar. Allow standing for several minutes. Next, combine the following to form a paste. Combine the ingredients, thoroughly mixing to form a thick paste. Place the paste on the stain and work it into the fabric. Let the homemade stain remover dry completely. Then wash the clothing as usual in the hottest water that is safe for the particular material. Many hairsprays contain alcohol, which you can use to dissolve the ink and remove the stain. You want to try and use hairspray that has a high level of alcohol, which is usually the least expensive brands. Place a clean towel under the fabric where the stained area is. Thoroughly spray the stain with the hairspray. Using another clean cloth, blot the area until you eliminate the stain. Then wash the garment as usual. You may be wondering why milk is on this list of techniques for getting ink stains out of clothes. Believe it or not, soaking ink-stained clothing in a milk bath can help remove the stains. This method requires you to fill a shallow container with enough milk to cover the stain when the garment is submerged. Let the clothing soak in the milk overnight, then remove and wash as usual. If you can catch the stain when it first appears, salt can end up being your best friend. Before the ink dries, cover it with salt. Using a damp paper towel, gently dab the stain. Brush the salt off and repeat the process until the stain disappears. If you’ve ever had an ink pen explode on you, then you’re probably aware of how hard it is to remove these kinds of stains from your clothing. Luckily, there are several techniques that you can use to remove the ink from your clothing. Using the homemade ink remover recipe and procedures outlined below will help you remove ink stains caused by your favorite pen from your clothes. In a medium-sized bowl, add the white vinegar, lemon juice, milk, and borax. Stir the ingredients to ensure they are well combined. Place the stained garment between two sheets of paper towels. Press down on the clothing to absorb as much of the ink as possible. Next, dip a paintbrush in the bowl, and paint the solution over the stain. Make sure you cover the entire area with the liquid. Leave for five minutes to allow the solution to seep into the stain. Next, take a damp sponge and press it over the stain a few times, until you remove the stain. Because of the alcohol content in everyday hand sanitizer, it can be an excellent remedy for removing ink stains from your clothes. Cover the stain with the hand sanitizer and allow to sit for ten minutes. Then, place the item in the washing machine and launder as usual, using the hottest water allowed for the fabric type. When it’s finished washing, check the garment to ensure the stain is gone before throwing it in the dryer. Nail polish remover is an extremely heavy-duty product, so you need to practice caution when using this method to avoid damaging the fabric. To test for colorfastness, apply a small amount of nail polish remover to an inner seam or hidden area of the clothing first. If it doesn’t discolor the fabric, place a clean, white towel under the garment where the stain appears. Then, soak a cotton ball with the nail polish remover and blot the stain, being sure to move the towel underneath to avoid the ink from transferring to another area of the clothing. Continue to blot the area until the stain disappears. When completed, rinse the fabric with warm water to remove the nail polish remover from the material. You no longer have to be embarrassed by the ugly ink stains that mar your clothing. With these simple techniques, you can quickly and easily remove ink from your clothing without having to resort to using harsh chemicals that are toxic. These simple, trusted at-home techniques will effectively rid your clothes of those unsightly ink stains. We hope you enjoyed learning how to get ink out of clothes. If you found the information in this article to be useful, please share it with all your friends and family.